Most have only really ever heard of or used Apple iCloud. iCloud is just for file storage, making the explanation for IaaS, SaaS, and other cloud solutions, that much more difficult because we do so much more. I imagine when it first came about, explaining the Internet was of similar difficulty (I can still remember when my mom thought each country I visited required the setup of a different email address to communicate). TechCrunch’s contributor blog featured this post by Alexander Haislip yesterday on what the cloud doesn’t do. I’d like to tell you about what the cloud, and specifically CloudShare, does. 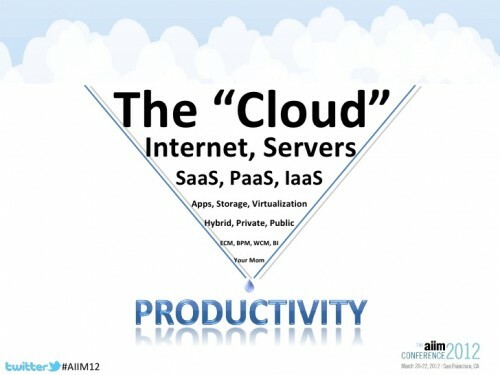 First of all, the “cloud” is most simply described as computer services over the Internet. Traditionally, anything you do on the computer is housed on your computer or on your company’s servers. The “cloud” allows for all of that “stuff” to be housed remotely. Your can now work directly from the cloud, or remote servers, and access whatever you need through an Internet connection. CloudShare takes this concept a couple steps further. With CloudShare, you are not only able to do all of your pre-production IT activities through our servers, you can use any of our pre-configured environments – saving you time, money, and concerns for data security. Want to test Visual Studio 2011 on servers that are separate from production? CloudShare gives you that ability. Want to share an environment with a colleague before moving to production? Build it on CloudShare. Are you leading a training course? CloudShare lets you develop what you need and share entire environments with your students with just one click. Your client wants to see a demo or Proof-of-Concept? Invite them to CloudShare to test out your product, even break your product, without ever affecting the real data. We don’t just save you from the hassle of infrastructure; we provide user friendly environments. You can build your own or choose from our Solutions Showcase. With CloudShare, there is no harm in failure. If something breaks, you can rebuild or revert in minutes. So, what is the cloud? Remote computing. What is CloudShare? The greatest level of flexibility for all of your testing, development, and pre-production needs.